To determine the titration curve for an amino acid. To use this curve to estimate the pKa values of the ionizable groups of the amino acid. To understand the acid base behaviour of an amino acid. 1) the number of ionizing groups, 2) the pKa of the ionizing group(s), 3) the buffer region(s). Amino Acids are weak Polyprotic Acids. They are present as zwitter ions at neutral pH and are amphoteric molecules that can be titrated with both acid and alkali. All of the amino acids have an acidic group (COOH) and a basic group (NH2) attached to the α carbon, and also they contain ionizable groups that act as weak acids or bases, giving off or taking on protons when the pH is altered. 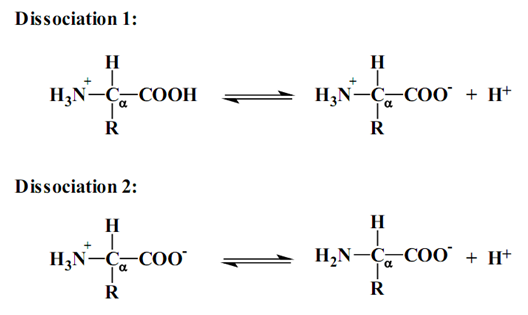 The strong positive charge on the amino group induces a tendency for the carboxylic acid group to lose a proton, so amino acids are considered to be strong acids. Some amino acids have other ionizable groups in their side chains and these can also be titrated. When an amino acid is dissolved in water it exists predominantly in the isoelectric form. The isoelectric point, pI, is the pH of an aqueous solution of an amino acid at which the molecules have no net charge. In other words, the positively charged groups are exactly balanced by the negatively charged groups. When this dissolved amino acid is titrated with acid, it acts as a base, and with base, it acts as an acid which makes them an amphoteric molecule. When the concentration of the unprotonated form equals that of the unprotonated form, the ratio of their concentrations equals 1, and log 1=0. Hence, pKa can be defined as the pH at which the concentrations of the protonated and unprotonated forms of a particular ionizable species are equal. The pKa also equals the pH at which the ionizable group is at its best buffering capacity; that is the pH at which the solution resists changes in pH most effectively. 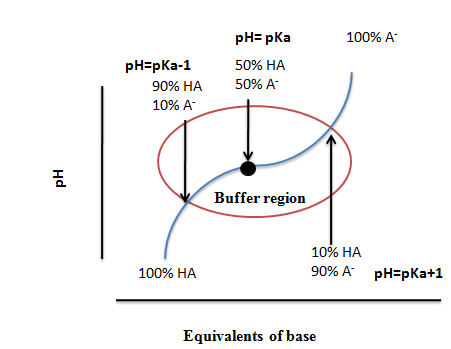 The pK is the pH at the midpoint of the buffering region (where the pH changes only slightly upon addition of either acid or base). The pK is the pH corresponding to the inflection point in the titration curve. The end point of a titration curve represents the observed end of the titration. The isoelectric point (isoelectric pH; pI) is the pH at which the amino acid has a net zero charge. For a simple diprotic amino acid, the pI falls halfway between the two pK values. For acidic amino acids, the pI is given by ½(pK1 + pK2) and for basic amino acids it’s given by ½(pK2 + pK3). In this experiment we are finding out the titration curve of the amino acid Glycine. Glycine is a diprotic amino acid which means that it has two dissociable Protons, one on the α amino group and the other on the carboxyl group. In the case of Glycine,the R group does not contribute a dissociable Proton. The dissociation of proton proceeds in a certain order which depends on the acidity of the proton: the one which is most acidic and having a lower pKa will dissociate first. So, the H+ on the α-COOH group (pKa1) will dissociate before that on the α-NH3 group (pKa2).